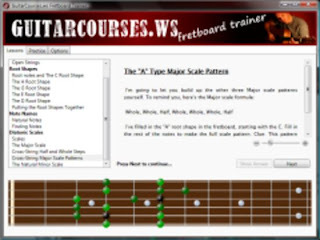 GuitarCourses.ws is offering their Fretboard Trainer software for free. That's right. For FREE! Designed to help the guitarist who is seeking to thoroughly learn the fingerboard, the Fretboard Trainer's primary aim is to increase fingerboard knowledge through visualization. And the guitar, as we all know, is an extremely visual instrument. The better we're able to visualize chords, scale shapes, arpeggios, licks and patterns, the better we can get around on the instrument. But much more than just a compendium of fingerboard diagra ms, the Fretboard Trainer also gets the user involved in practical exercises after each lesson that involve finding and entering the correct notes on the virtual fingerboard with the mouse. Which means any one can now work on their fingerboard knowledge away from the instrument, with just a computer or a laptop. Just make sure the boss man isn't looking over your shoulder when you do it. An extra lesson on Pentatonic scales is also available as a free bonus if you sign up for the GuitarCourses newsletter.